In building my dream practice, I had a few very specific goals for Newtown Square Veterinary Hospital. One was to create a personalized, progressive hospital with a family-friendly feel and state of the art medicine. Second was to provide our patients with a calm, welcoming and stress-free environment. Third was to design a hospital that specifically embraces our feline patients, ensuring our kitty friends receive the medical care that they often lack. Fourth was to continue to love what I do each and every day. NSVH is well on our way to achieving all of these goals! I’m excited to announce that I am now officially certified as a Fear Free Certified Professional, having completed several hours of training in fear free handling techniques. Many of our patients are stressed and anxious about coming to the veterinarian, and this may lead to pets not receiving the medical care they need in a timely fashion. NSVH has fully embraced the Fear Free Practice movement, and our entire staff is undergoing certification in stress-free, gentle handling techniques for our patients. 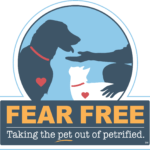 Fear Free certification has provided us with a number of techniques to keep your pet’s visits to NSVH as stress-free as possible. We have a number of highly tasty food treats to keep our patients occupied during examinations, vaccinations and blood draws. 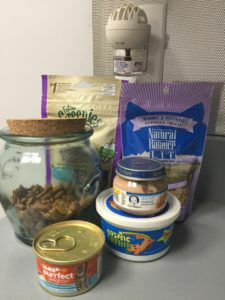 Food is such a powerful motivator for our pets, and it helps to reinforce the positive experience they have at NSVH. With your permission, we may offer your pup cheese, peanut butter or other highly delectable items while doing our examinations and procedures. 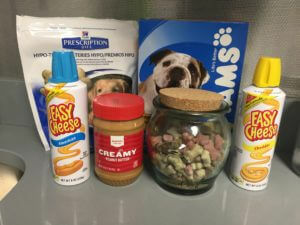 For our feline patients, we have cheese, baby food and various canned foods to happily occupy your kitty. Our exam rooms are equipped with species-specific pheromones, scientifically proven to have a calming effect on stressed dogs and cats. We also have warm blankets for our feline patients, and comfortable traction mats for our larger canine patients to feel comfortable on our floors. Our technicians and myself have undergone hours of training in gentle, calm handling techniques that minimize stress. If these techniques are not enough to reduce your pet’s anxiety about the vet, we can discuss the addition of natural supplements and/or prescription medications to help! Our Fear Free Practice mission closely aligns with our Cat Friendly Practice mission. NSVH has separate waiting, hospitalization and exam rooms that are designated solely for our feline friends. This helps keep our kitty patients calm and fear free! I just submitted our Cat Friendly Practice application to the American Association of Feline Practitioners, and we will share more details about our certification once it is official.